The chart above shows the Infant Mortality Rate, measured in deaths per 1000 live births, against the rate of god-belief. All developed countries sit along the bottom, no matter what their level of belief in God is. For example, Poland has a good infant mortality rate of 4/1000, and only 3% of the population disbelieve in God. Nearby Estonia has a similar infant mortality rate (3/1000) but a full half of the population do not believe in God. This means that richer countries experience better infant mortality rates, and prayer does not make a difference to them. A huge number of poor countries, where rate of belief in God is very high, sit along the left. This means that in poor countries, infant mortality rate is high, and, so is the extent to which mothers are praying for their children. This means that praying, compassionately and desperately, for the health of their own children does not work. But the ultimate comparison is within demographic areas. 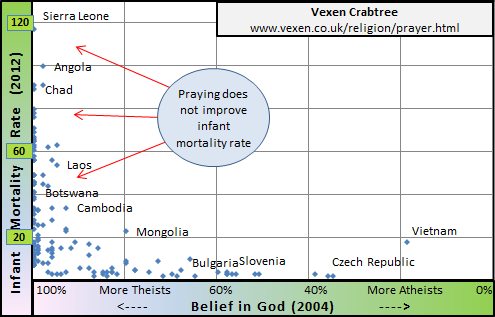 Very poor countries such as Vietnam have the same infant mortality rate as their near neighbours, but, have a completely different rate of praying (due to a high level of disbelief in God). What this shows us is that internationally, on average, and, compared to their neighbours, rich and poor countries' infant mortality rates are not affected by the rate of belief in God. In other words, prayer is making no difference. (2007) Atheism: contemporary numbers and patterns. In M.Martin (Ed. ), The Cambridge Companion to Atheism. Cambridge: Cambridge University Press. In "Average intelligence predicts atheism rates across 137 nations" by Lynn et al. (2009)1.